"It was one of the best teambuilding events we have done as a company!" St. Louis will welcome your team building or corporate training event with open arms in keeping with its long history of welcoming and preparing trailblazers for the challenges ahead. St. Louis combines a wide variety of flavors to suit many different tastes, from its signature barbeque and Anhueser-Busch brews to neighborhoods spanning the nightlife of Laclede’s Landing to historic brick townhomes of Soulard. 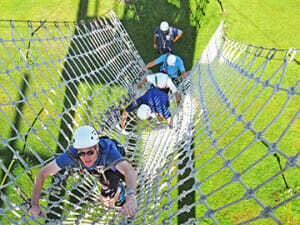 Pioneering adventure goes high-tech with our Gateway City GeoTrek team building event. Equipped with GPS units, maps, clues and “on-the-go” challenges, each team develops its own strategy and charts a completely unique course around St. Louis. Your small team of 4-5 might decide to collect points around the downtown, visiting the Cardinals home at Busch Stadium and taking in views of the Missouri river from the Arch. Or you might head further afield by jumping on the MetroLink to join the shoppers in the Delmar Loop or head for the peaceful greenery of Forest Park. No matter what route you choose, your success will hinge on forming a strong team from the start by clarifying roles and identifying strengths. On-the-go challenges including mental puzzles and innovative photo assignments encourage teams to multi-task, practice problem-solving skills and learn more about your team members. Just half an hour from the city center, your team can explore risk-taking, leadership, communication, and coaching as they scale a 50 foot tower during our Ropes Course. Build on this experiential learning with a training to boost your team’s leadership and communication skills through our Myers-Briggs Type Indicator® workshop. Consider the meeting rooms at centrally located hotels like the Ritz Carlton.